FFA - Catholic school allows prominent Islamist activist to present Islamophobia propaganda to Catholic school students. Ahmed Bedier lectured Catholic students regarding Islamophobia. Click here to send email of concern to Catholic church officials. This email will open in your email browser unlike most email campaigns. This is because the Catholic Church is blocking emails from Florida Family Association’s email delivery server. If the above link does not open in your email browser or if the email is returned to you please prepare an email using the suggested email subject line, email content and four email addresses provided at the end of this article. or post your concerns at the St. Petersburg Catholic School website contact form. The infamous founder and past executive director of the Tampa chapter of the Council on American-Islamic Relations (CAIR), Ahmed Bedier, was given unfettered access to St Petersburg Catholic High School children to spew and spread his vile hate. If a religious school not only sanctions this deceptive propaganda, but gifts these terror-tied CAIR operatives their own school assembly, what shot do our kids have? Despite the continuing Muslim genocide of Christians in the Middle East and Africa, American Catholic leaders continue not only to turn a blind eye to jihad terror and the persecution of their fellow Christians, but are actively aiding and abetting the forces that are persecuting them. Last month, the entire student body of St. Petersburg Catholic High School in St. Petersburg, Florida, was called together to hear a deceptive presentation on “Islamophobia” from the notorious Ahmed Bedier, who openly supports the jihad terror group Hezbollah and has worked for the Hamas-linked Council on American-Islamic Relations (CAIR). • Is the leader of the national Islamist organization called United Voices for America. One of United Voices of America’s top issues is to oppose federal legislation that would prohibit American courts from recognizing Sharia law. • Was the founder and director of the Tampa office of the Council on Islamic-American Relations. 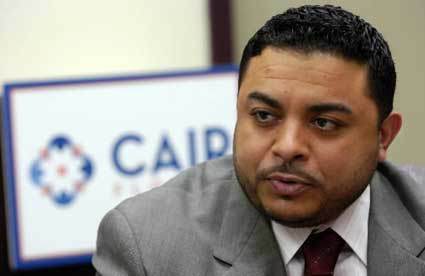 • As CAIR Tampa director, Ahmed Bedier defended Sami Al Arian, who was indicted and plead to federal charges of raising support for a Palestinian terrorist organization. The Tampa Tribune reported in part on April 15, 2006: “Ahmed Bedier, Tampa spokesman for the Council on American Islamic Relations, said Moffitt was wrong about the Al-Arian plea. Al-Arian did not agree to admit to any charges associated with terrorism, Bedier said. He stayed true to his convictions - he stayed true he wasn't going to plead to those issues," Bedier said. "There is no conspiracy to support terrorism. Bedier said he could not reveal what charge Al-Arian agreed to, and he refused to reveal the source of his information. Bedier convened a 7 p.m. news conference, saying he hoped to have Al-Arian's family there. They did not appear. • As CAIR Tampa director, Ahmed Bedier spoke on behalf of Youssef Megahed one of two University of South Florida students who were arrested for allegedly carrying pipe bombs near the Goose Creek, S.C a naval base and Megahed was arrested later for deportation. The Tampa Tribune reported in part on September 1, 2007 "We have faith in the American judicial system," said Ahmed Bedier, executive director of the Tampa chapter of the Council on American Islamic Relations. "So far we've only heard and read about vague language describing an explosive device, but no actual evidence. Until that's displayed it's going to be unclear what's going on." • As CAIR Tampa director, Ahmed Bedier’s lobbying efforts resulted in the Hillsborough County School Board removing Yom Kippur and Good Friday from the school calendar even after nearly sixty percent of the students (supported by parents) protested by staying home from school on subsequent Good Fridays. The school district reversed their policy after less than twenty five percent of the student body showed up for school on a subsequent Good Friday. Ahmed Bedier made reckless and erroneous statements and disparaged numerous people and institutions who have legitimate concerns about the Islamist political and cultural agenda in America. It was irresponsible to allow his pro-Islamist propaganda to be presented to students. It is truly disappointing that the St. Petersburg Catholic High School allowed Ahmed Bedier with his Islamist background and agenda to proclaim the bogus evils of Islamophobia to impressionable students. Florida Family Association has prepared an email for you to send to express concern to officials at the Roman Catholic Diocese of St. Petersburg Florida regarding Ahmed Bedier’s presentation to students in their care. To send your email, please click the following link. This email will open in your email browser unlike other email campaigns on this web site. This is because the Catholic Church is blocking emails from Florida Family Association’s email delivery server. Please feel free to change the subject or message text if you wish. Very disappointed that Catholic High School allowed pro-Islamist leader to address students. I am very disappointed that the St. Petersburg Catholic High School allowed Ahmed Bedier with his Islamist background and agenda to proclaim the bogus evils of Islamophobia to impressionable students. Ahmed Bedier leads Islamist organizations, has lobbied for the legalization of Sharia law in America and publicly defended and represented convicted terrorists. Bedier has also lobbied in a manner that resulted in Christian holidays being removed from a public school district calendar. I urge the Roman Catholic Diocese of St. Petersburg Florida to use more discretion in the people they select to speak into the hearts and minds of the students in their care.